There is a positive outlook for U.S. construction starts in 2018. The Dodge Data & Analytics’ 2018 Construction Report forecasts a three percent average increase across the various sectors (residential, commercial, industrial, etc.). 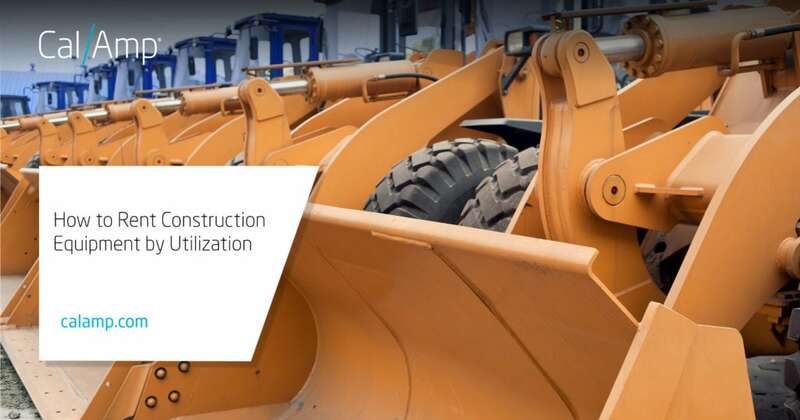 However, the rental market for construction heavy equipment is expected to grow between four and five percent according to the American Rental Association. Although encouraging news, it does not guarantee a profit for your company due to increased competition, overhead costs, taxes and more. While lowering prices and expanding equipment selection are traditionally good ways of attracting new customers, they can be potentially unprofitable, especially if it becomes difficult to balance inventory. Another approach is to reassess you rental fleet utilization by reviewing current performance of your assets. Introducing a telematics solution that makes it possible to evaluate your current fleet operations and consider renting out equipment by actual utilization, which provides greater opportunities to increase revenue. When considered from the contractor’s perspective, there are several disadvantages to renting equipment by the typical hourly, daily or weekly timeframe. It can be difficult to predict the correct amount of time needed for a certain type of equipment, such as a boom crane or excavator. An overestimation means there is the risk of spending more money than is necessary. Yet, if the amount of time is underestimated, the contractor may incur additional expenses for extending the contract or returning it late. While the rental company is unable to offer the asset to another customer. This delay in returning an asset can also have a ripple effect on a rental company’s inventory. For example, if one contractor overestimates the amount of time equipment is needed, it will sit idle even as another contractor needs it. As a result, there is a potential loss of income. Likewise, if a customer needs equipment for longer than expected, a disruption occurs when another customer needs the equipment per his or her contract. Both situations demonstrate how inefficient renting out equipment by the typical time option can be. Implementing an asset telematics solution to intelligently track utilization offers benefits to both the rental company and their customers. A report indicates the time the asset ignition turned on and off. Additionally, rental companies can even send updates for the time charged. Heavy equipment telematics, such as CalAmp’s AssetOutlook™, monitors direct engine hours among other key rental attributes. When predefined exceptions occur, such as leaving a defined area, the alert function sends a notification by email or text to the responsible parties. The information indicates the following possible situations: pickup or delivery of equipment, unneeded equipment, overutilization, unauthorized use, proactive maintenance required or any combination.